This five angled star fruit, yellow-green in color is about 5 to 15 centimeters (2 to 6 inches) in length and is an oval shape. 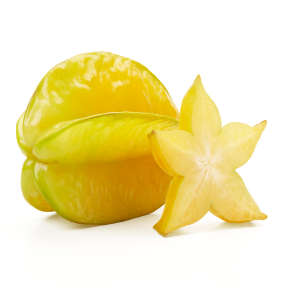 The most unique visual quality of the star fruit is its shape – that of a perfect star when it’s cut across the middle. The entire fruit is edible including the slightly waxy skin. Handling: When ripe, star fruit appear mainly bright yellow with tinges of light green. They may have some dark brown along the five ridges – this is normal. The flesh should still be quite firm to the touch. You can also buy star fruit when it’s green and wait for it to ripen – just leave it on your counter for a few days. When over-ripe, star fruit turns entirely yellow and starts to have brown spots all over. Varieties: There are two varieties; the small sour or tart and larger sweet type. As a general rule, the sweet type has thicker flesh.